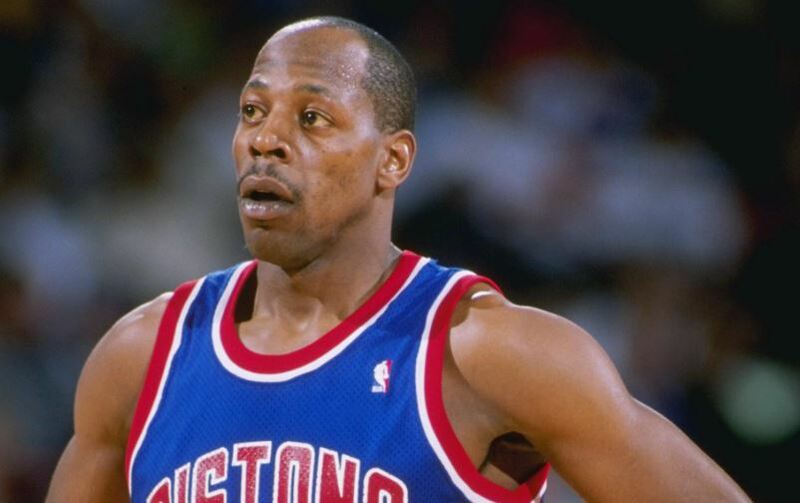 Vinnie Johnson was the longtime sixth man for the NBA's Detroit Pistons. He was a perennial fan favorite. He played 10 seasons in Detroit and was a part of the 1989 and 1990 NBA Championship teams. For most people, that career would be the pinnacle of success, a lifetime achievement, laurels to rest on for the rest of your life… you get the point. But for Johnson, it was just the beginning. After Johnson retired from the NBA following the 1992 season, he took on a new challenge. In 1995, he founded the automobile supply company the Piston Group. His goal was to bring jobs and opportunity as well as economic vitality to Detroit. The company quickly grew into the leading supplier of major automobile companies, including Ford Motor Company. Johnson was born September 1, 1956 in Brooklyn, New York. He started his basketball career in 1975 at McLennan Community College in Waco, Texas. He was the star player there for two years and led the team to the NJCAA national tournament in the 1976-77 season. He averaged 29 points per game and was named a junior college All-American. The following year, he transferred to Baylor University, also in Waco. He was a two-time All American at Baylor. He played the 1977-78 and 1978-79 seasons for the Baylor Bears and was one of the most prolific scorers in the University's history. He averaged 24.1 points per game in his two seasons. He is still the school record holder in points per game average today. He also holds the school record for most points scored per game. He scored 50 points against TCU in 1979. Johnson was chosen as the 7th overall pick in the 1979 NBA draft by the Seattle SuperSonics. In November 1981, he was traded to the Detroit Pistons. At 6'2″, he could be either a point guard (replacing Isiah Thomas) or a shooting guard. He got his nickname, The Microwave, from the Boston Celtics' Danny Ainge for his ability to come off the bench and instantly heat up the offense. Late in his basketball career, Johnson sank a 14 foot shot with 0.7 seconds left on the clock to beat the Portland Trail Blazers 92-90 in Game 5 of the NBA finals. This gave the Pistons their second championship in as many years. That shot earned Johnson a new nickname – 007. Johnson retired from professional basketball at the end of the 1991-92 season. He was 35 and began to think about what he wanted to do next. He started a construction company with some friends – that venture went under after one project. Then he partnered up with his former Pistons teammate Bill Laimbeer in a company that made packaging supplies for automakers in Detroit's empowerment zone – and area where federal tax breaks promote development. The company was struggling to stay in business when Johnson read a newspaper article in which Harold Kutner, GM's vice president of global purchasing in the 90s, pledged to support companies willing to open in Detroit with jobs for the city's residents. Johnson picked up the phone and called GM. At the time, his company was only doing $50,000 worth of business with GM. Kutner took the call and two months later, he was at Johnson's plant checking out the business. Johnson told him his story. Kutner told him to get out of packaging and into auto supplies. If he did this, Kutner said he would support him with some opportunities. Two months later, the Piston Group had a new contract with GM. Learning the ropes in the auto industry was a struggle. GM recognized Johnson's potential and sent in a consultant to help. That consultant was Bill Diehl. The CEO of Detroit consulting firm BBK. He was sent to turn Johnson's company around operationally and financially. Diehl gives a lot of the credit to Johnson. He has said that the spark and personality of Johnson is what Kutner saw and liked. Johnson had not yet developed his business skills, but it was clear to the GM exec that he had an entrepreneurial spirit. Today, Johnson's Piston Group's customer list includes the big 3 in Detroit as well as Toyota, Honda, and Nissan. Johnson is the Piston Group's Chairman and CEO. Under his leadership, the company has expanded from one location in Detroit to several across the Midwest including Michigan, Ohio, Missouri, and Kentucky. Today, the Piston Group does nearly $3 billion in annual revenue and has given Johnson, who earned about $5 million total in 12 seasons in the NBA, a net worth of $400 million!!! Over the years, there have been a number of athletes who have failed at making the transition, but there have been many that have succeeded in making the shift from athlete to entrepreneur.